Our group includes a diverse and dynamic range of scientists, from undergraduate and post-undergraduate interns, to technicians with decades of experience, to post-docs and PIs. We'd love to have you join us! The post-docs and research associates. Avni's research focuses on the multi-scale effects of disturbance on ecosystem structure and function. She is interested in the influence of disturbances such as drought, permafrost thaw, and warming on above- and belowground plant dynamics, greenhouse gas fluxes, and litter decomposition. She is also interested in regional to global-scale drivers of carbon sequestration. Avni was a post-doc with our group from 2016 - 2018, working on the SPRUCE experiment. She's now a post-doc with Rob Jackson at Stanford. Luke is interested in how natural and human-induced factors impact and change terrestrial ecosystems. While his work demonstrates a particular interest belowground, his overarching goal is to provide insight into how belowground processes connect with and act as part of a larger whole. ​Luke was part of our group from 2017 - 2018, where he joined us as a co-PI on the FRED project. He started a cool job at the Morton Arboretum in 2018 but we still claim him as our own! Verity’s research focuses on nitrogen cycling within rapidly warming arctic ecosystems. Her field work is based in Alaska through the NGEE Arctic project and investigates variation in root traits across arctic plant communities, symbiotic nitrogen fixation by alder shrubs, and plant uptake of nitrogen in response to short-term warming. ​Verity has been a post-doc with our group since 2016, working on the NGEE Arctic project. Deanne is our analytical expert. 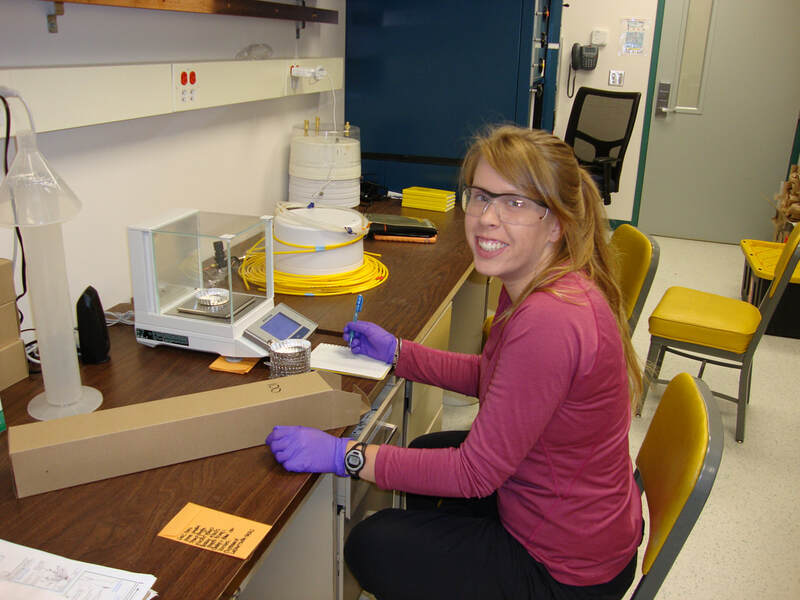 She quantifies the elemental and isotopic composition of plant and soil samples on a wide range of instruments in the analytical labs that she manages. She's also the point person for a number of sampling campaigns associated with the SPRUCE experiment in Northern Minnesota. Deanne has been part of our group since 2011. Joanne is our root expert and minirhizotron guru. She has been tracing roots in minirhizotron images since before you were born...literally. She also runs the ecology labs and keeps everyone in line, and travels to Alaska, Minnesota, Puerto Rico, and Brazil to measure everything from physiology to moss growth to soil nutrient availability. Joanne has been part of our group since before there was a group. John is a renaissance man. He hosts a weekly 'phenology' radio show on for KAXE in Grand Rapids, MN. He used to be a rural mail carrier. Oh, and in his free time he is also a major part of the SPRUCE experimental team, where he collects minirhizotron images and ion-exchange resins, as well as observations of plant phenology. John has been part of our group since 2014. Shafer is single-handedly responsible for the data input into the Fine-Root Ecology Database (FRED). That's more than 1 million data points! He's also responsible for the name 'FRED', though the 'F' was originally for 'Fantastic'. ​Shafer was a part of the lab from 2014 - 2018; he took a break for a year for a cool job at ORNL's NASA DAAC and to start an MS program in Data Informatics, but we're happy to have him back with us in 2019! Ingrid worked with us on the NGEE Arctic project, where she headed up a project related to how tundra plants access nitrogen throughout the soil profile. Her root-picking game was on point, and she was a lot of fun to have along in the field. ​​Ingrid was part of our group from 2013 - 2014; she's now a graduate student in Alan Knapp's lab at Colorado State University. She still loves roots, but she's now focused on prairie ecosystems. ​Holly was part of our group from 2014 - 2018; she's now got a cool job at the Kellogg Biological Station!